I know Brussels sprouts are supposed to be gross-out territory for a lot of children, but Ellie has always been a big fan of those cute, little cabbages. We typically roast them or saute them with bacon pieces, both ways are far better than the boiled-to-death treatment of frozen sprouts from the 1970s. This Christmas Eve, we featured sprouts in a new way–roasted with apples, onions, and lemon juice. They were incredibly good provided a much-needed change of pace in our sprout menu! You can adjust the amounts here depending on your family size and whether these are a main dish or side dish (this would make a fabulous vegan main dish). We served 6 as a side dish and there were barely any sprouts left over. If you can find fresh Brussels sprouts, definitely go that route. The flavor and texture is far superior to frozen. 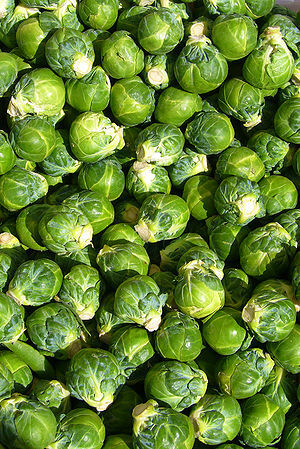 Brussels Sprouts are typically found in the late fall and early winter. If you can’t find local, fresh sprouts, then use flash frozen sprouts in a bag, not the kind that come in a square box with lots of added water. Water is not a sprouts best friend. And whatever you do, don’t skimp on the lemon zest and juice. It really makes this dish special! Preheat oven to 350 degrees (see note below). Put the prepared sprouts, apple and onion into a large mixing bowl. Sprinkle with salt and pepper. Pour olive oil over vegetables in bowl and toss to coat all. Pour vegetable/apple mixture onto a rimmed baking sheet (line sheet with foil for easy clean up). Roast vegetables in the oven for about 50 minutes, stirring occasionally. Sprouts and onion should start to brown. Remove from oven and pour all into a serving bowl. Add zest and lemon juice and toss well. Note: You can roast this mix at a higher temperature (400 degrees) for a shorter period of time. Since I was roasting these while heating our seafood casserole, I roasted them longer at a lower temperature. Either works just fine.